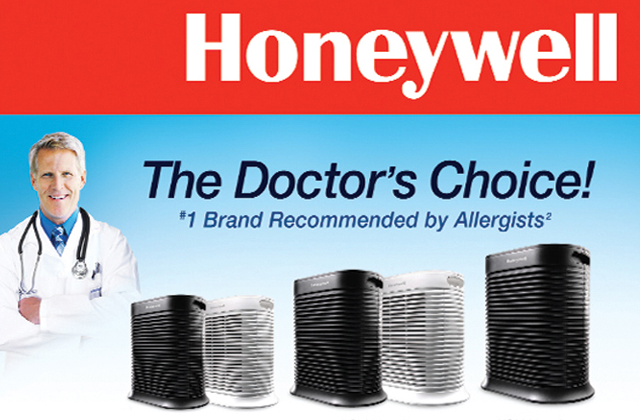 Honeywell Air Purifiers are the #1 brand of air cleaner recommended by allergists, and are available in a wide variety of sizes and stylish modern designs to easily blend in to any room decor. Every Honeywell Air Purifier has been given Clean Air Delivery Ratings (CADR) by the Association of Home Appliance Manufacturers (AHAM). Room Size: 21' x 22' (465 sq ft) CADR: 300 Smoke, 320 Dust, 300 Pollen Speeds: 4. Electronic Controls. Room Size: 14' x 14' (200 sq ft) CADR: 130 Smoke, 130 Dust, 130 Pollen Speeds: 3. Room Size: 17' x 18' (310 sq ft) CADR: 200 Smoke, 190 Dust, 180 Pollen Speeds: 4. Electronic Controls. Room Size: 15' x 26' (390 sq ft) CADR: 250 Smoke, 250 Dust, 250 Pollen Speeds: 3. Room Size: 13' x 13' (170 sq ft) CADR: 110 Smoke, 120 Dust, 130 Pollen Speeds: 4. Electronic Controls. Room Size: 12' x 13' (155 sq ft) CADR: 100 Smoke, 106 Dust, 100 Pollen Speeds: 4. Electronic Controls. Room Size: 12' x 13' (155 sq ft) CADR: 100 Smoke, 106 Dust, 100 Pollen Speeds: 3.